Please join us for this special evening as we welcome our new officers and board of directors. 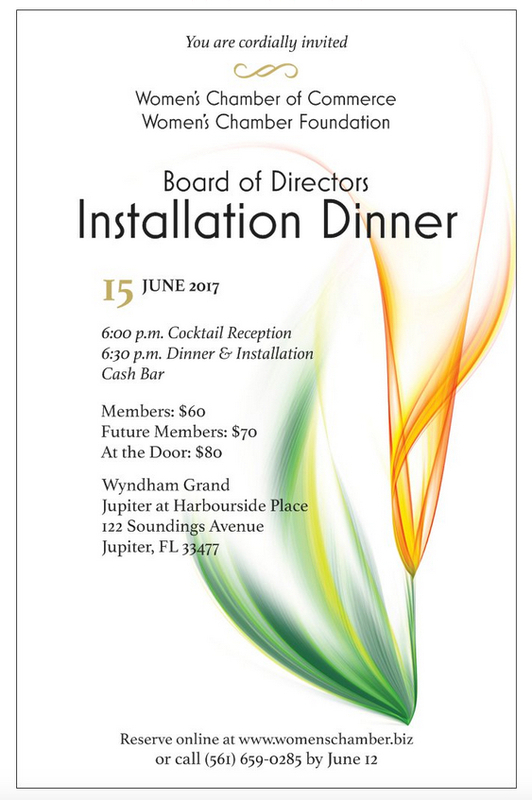 Cocktail Reception begins at 6:00 p.m. with Dinner and Installation by West Palm Beach Mayor Jeri Muoio following. We are pleased to welcome Jeneissy Azcuy, Director of Corporate Communications for South Florida PBS, as the event emcee. Interested in reserving a guest room? The Women’s Chamber has been given a special room discount of $99. Please contact Jennifer Timpano at jtimpano@wyndham.com or call 561.273.6695 to make your reservation. Special Opportunity: Kelly Wagner of Coastal Click Photography (official photographer of the Women’s Chamber ) is offering a 50% discount to all attendees who wish to have portraits taken. Please arrive by 5:30 p.m. to take advantage of this great value. Flyer with details can be downloaded here: Women’s Chamber Portrait Special. Please make your RESERVATION by June 12, 2017.